Hello and thank you for visiting this page of my website, my Bournemouth Photographer web page. On this page you can see 12 of my pictures of Bournemouth. I have not included any of my commercial photography work, as there are plenty of other pages which you can visit – if you go to the bottom of this page you will find a list of these pages with links which take you straight to them. Please read the bits in the middle though first if you have the time. If you would allow me to deal with myself as a photographer in Bournemouth first then you can read on to find out a little bit more about the images on my website. I specialise in architectural, commercial, construction, industrial and lifestyle photography. The lifestyle photography is a logical extension of the commercial photography work I have been doing for some time now. I work mainly in Dorset and Hampshire, and the vast majority of my work is for commercial clients. I price each commercial photography assignment on an individual basis, and normally charge on a half day rate or full day rate. I am the only person you deal with. I take the photos and process them myself. I have my own photographic style which hopefully you can see on not only this page but other pages on my website. I process all the images myself in Adobe Lightroom and Adobe Photoshop, using the latest versions of the software. I can produce high quality, technically correct photographs with the workflow which I have developed over years of using Lightroom and Photoshop. I am constantly working on my image capture and composition, and am a student of how the light interacts in a scene. In case you hadn’t already worked it out I rather like my photography work! I respond to everyone who takes the time and trouble to get in touch with me. As well as providing high quality imagery, I also strive to provide a high quality professional service from the initial inquiry to the electronic issue of a fully edited set of images. That’s enough about me – sales pitch over – so here is a little it about the twelve pictures of Bournemouth – after all if you have found this web page you are most likely interested in looking at pictures of Bournemouth or finding a photographer in Bournemouth. And if not welcome to this page of my website anyway! The text that follows is in date order, starting with the oldest image. This is how I sort images in Lightroom, and the order in which I uploaded them. I do rotate the pictures on my website so they may not be in the same order as the text, but I am sure you will work it all out just fine. Just wanted to let you know. This is an old image, captured using my Canon 5D and trusty Canon 24-105mm lens. The picture was taken on late January afternoon, and captures a surfer approaching Bournemouth Pier as the sun sets in the background. Surfers are a common site in Bournemouth now, and I like this picture as it captures four elements of modern Bournemouth in one picture. For me this picture tells a story of Bournemouth. Another picture taken using my Canon 5D camera, this time with my Canon 70-200mm lens. 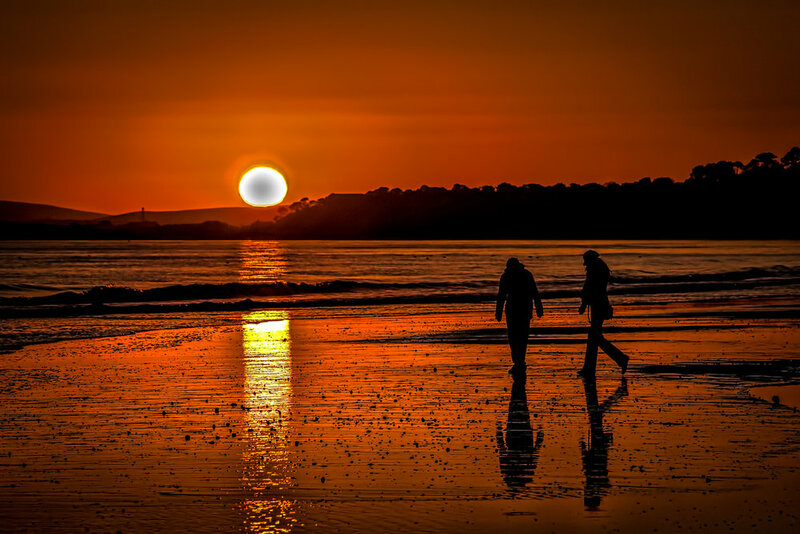 The telephoto lens compresses the scene, making the composition more intimate, isolating the moment which is a couple walking on the beach at sunset. Another picture of surfers on Bournemouth Beach. This time two surfers are walking away from the sea as the sun sets in the background. I have captured the distinctive shape of the boards in the reflection of the water on the beach in one of the channels of water left as the tide recedes. This scene is illuminated by the glow of late evening sunshine. Another classic English seaside scene is this picture of two stacks of deck chairs on Bournemouth Pier. Combined with the telescope on the right hand side, with the beach, sea and clouds warmed by the setting sun to the west, this is another lovely English seaside scene. This picture could have been taken anywhere. But it was taken on Bournemouth Beach. A lone bird flying illuminated by the glow of the setting sun. There is a vapour trail from a plane adding interest to the sky. This picture was taken using my Canon 100-400mm lens allowing me to get close to the bird with the chosen focal length of 135mm. I have added a vignette to this picture, which focuses the eye on the subject of the picture. This is an example of the creative image editing that I am able to produce – image capture is key but there is often more that can be done to make an image more interesting, or dare I say special. For me there are two elements which combine to make this photograph of Bournemouth Pier – the range of colours after sunset and the leading lines that take the eye into the picture, and provide depth to the image. Another picture that could have been taken anywhere. But this is Bournemouth Beach photographed from East Overcliff Drive. I have excluded everything else from this image leaving the three elements, the sun, the sea and the beach. The colour from the sun links the three elements together. I took this picture using my Canon 6D with 24-105mm lens at a focal length of 105mm. For those who don’t know Bournemouth that well, the conurbation of Bournemouth spreads west into Poole, and east into Boscombe. Boscombe has its own pier too, called Boscombe Pier, which you can see in the background in this picture. I like the colours in this picture, which were the reason I took this photograph. I wanted to produce an interesting composition, which I feel I have achieved with the inclusion of a groyne in the foreground giving scale and dimension to the picture. Sometimes an unusual composition makes you look twice – makes an image more interesting. Another picture taken from East Overcliff Drive, this time looking to the west to Bournemouth Pier with Sandbanks beach in the background. I included some foliage in the foreground to give this image a sense of depth, and provide an amount of framing for the pier. This picture is all about the light. That early morning directional sunlight giving depth and texture to the natural lines on the beach. This lovely early morning sunlight also gives the scene warmth. This picture was taken at 9.10am one February morning using my Canon, wait for it, Powershot G11. I did not even notice this when I was processing this new set of pictures of Bournemouth, such is the quality of that little Canon G11 (long forgotten unfortunately). "A sculpture has been unveiled in Dorset as a memorial to a Red Arrows pilot who died after an airshow display. Flt Lt Jon Egging, 33, of Rutland, died when his Hawk T1 aircraft crashed following a display at the 2011 Bournemouth Air Festival. The 5m-high artwork on Bournemouth's East Overcliff was unveiled at a private ceremony ahead of this year's airshow, which starts on Thursday. It features three glass Red Arrows planes and stainless steel contrails. The pilot's widow, Dr Emma Egging, said: "It's an absolute privilege to see the memorial being unveiled. But of course being here will always remind me of Jon and last year. "Jon loved being in the Red Arrows and the memorial encapsulates the spirit of the team, the positivity and the idea that with hard work and determination you can achieve your dreams." Each contrail also has 60 coloured glass discs in the Red Arrow's traditional colours of red, white and blue. The one tonne sculpture, created by Tim Ward, of Circling the Square, was designed by Penny Vallier, 10, and George Cutler, nine, from Kinson Primary School in Bournemouth. Their design was chosen by Dr Egging following a competition held at Bournemouth schools last year. Among the members of the Red Arrows who attended the unveiling, Flt Lt Ben Plank said: "For me it is a reflection of the support the team have received from the people of Bournemouth. "After the tragedy of last year, the team was overwhelmed to have that support behind us when we needed it." Councillor John Beesley, leader of Bournemouth Borough Council, said the memorial would serve as "a long-standing mark of respect from the people of Bournemouth". Flt Lt Egging, who grew up in Southam, Warwickshire, was killed when his aircraft crashed into a field at the village of Throop, near Bournemouth Airport, on 20 August last year. The 2012 Bournemouth Air Festival runs until Sunday." This image was taken on my Canon 6D with Canon 17-40mm lens on a very cold November morning. A morning with a great sky is has to be said. As I have said many times before, I like to include alternative views of familiar places. This is Bournemouth Beach and Pier photographed from one of the zigzag paths down to the beach from in front of the Marriott Hotel. The unusual view was achieved by me using a fish eye zoom lens, the Canon 8-15mm lens, with strangely enough a focal length of 14mm. That is my 12 pictures of Bournemouth, which I hope you like. And if there is a picture of Bournemouth you would like me to take for you please let me know. I will update these pictures from time to time, and committed on my photography blog to including a picture of The Vitality Stadium, the home of AFC Bournemouth and Premier League football in Dorset. That was August 2017 – if the picture of the stadium at AFC Bournemouth is on this page of my website then I guess it is October 2017 or later? Now, back to my commercial photography work, which I mentioned before. Whilst this page is all about my work as a photographer in Bournemouth, and of photographs taken by myself in Bournemouth, these are the pages that cover my commercial photography work. So whatever your photographic requirement in Bournemouth and the surrounding areas of Bournemouth please get in touch with me and let me see how I can help you. I am based in the Bournemouth and Poole conurbation, and know the area very well, so can add a local, personal touch to the high quality professional photography services that I provide.